Mommy bracelets, also known as Mothers Bracelets, are a beautiful way to show how PROUD you are to be a Mom. Each bracelet at mymommysbracelets.com is designed using high quality beads and components such as solid sterling silver, 14K gold fill, genuine Swarovski crystals and pearls, and much more. Each and every one of my bracelets can be customized for you with multiple names and/or strands, Swarovski crystals to represent your childs birthstone, a special clasp, or even a charm to add a personal touch. Custom orders are always welcomed. If you don't see exactly what you are looking for please email me so that we can work together to create a your perfect Mommy Bracelet. mymommysbracelets.com is hosting a Valentine's Day Giveaway featuring many wonderful online Mommy and Baby Boutiques. There are some great prizes this time including 2 from yours truly, one from mymommysbracelets.com and another from Baby Girl Bracelets. The giveway starts February 1st with winners chosen on the 14th. 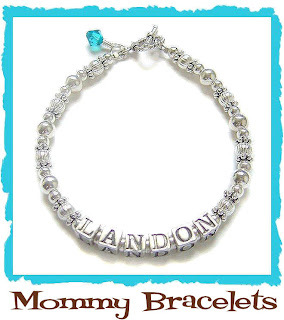 Simply visit http://www.mymommysbracelets.com/, click on the banner, and fill out the entry form. GOOD LUCK! Welcome to my new blog. This is all so new to me, so bear with me while I work out the kinks. I hope you enjoy it and will visit often. Here is where I will be including new items along with any updates to http://www.mymommysbracelets.com/ and also http://www.babygirlbracelets.com/. I will also let you know about any great discounts or freebies I can find from other Mommy and Baby Boutiques.